When you arrive to Barcelona, your first instinct might be to dive right into Barcelona’s bar and restaurant scene. Before you do, it’s important to know where to go. An absolute no-no is La Rambla, where, you’ll find overpriced, bad quality restaurants and bars full of tourists who don’t know any better. Locals (and travellers in the know) tend to avoid this tourist trap. Somewhere to steer clear from if you’re on a budget are the bars and clubs along the beach like Pacha and Shoko – these will leave you will a very empty wallet. That’s not to say don’t visit there at all… maybe save it for a treat on your last night. To find the perfect balance between quality and price away from the masses of tourists, you need to be prepared to venture into some of the more local districts. El Born is one of the more stylish and hip zones of Barcelona full of endless delicious tapas bars and Catalan cuisine. 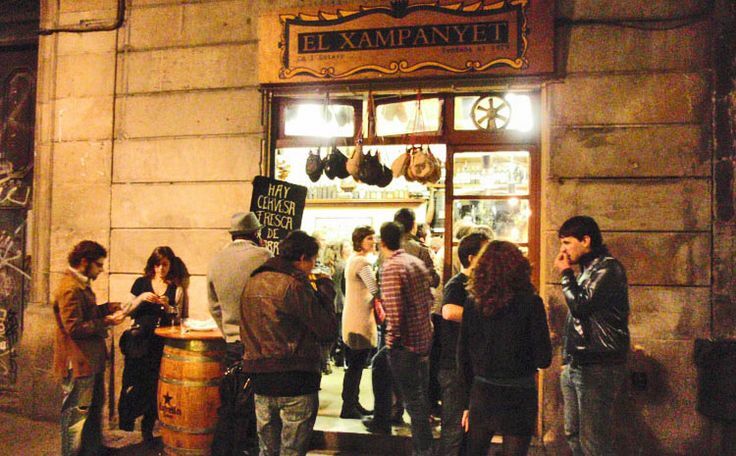 El Xampanyet (Carrer de Montcada, 22) is a small tapas bar in the heart of El Born that has totally conserved the style of the typical tapas bars you’d find in Barcelona many years ago. It serves plates of tapas, cheeses and ham and a wide selection of champagne. Its very popular among locals and gets extremely busy – get there as early possible if you want a seat. La Paradeta (7 Carrer Comercial), also in El Born, is seafood monster heaven. 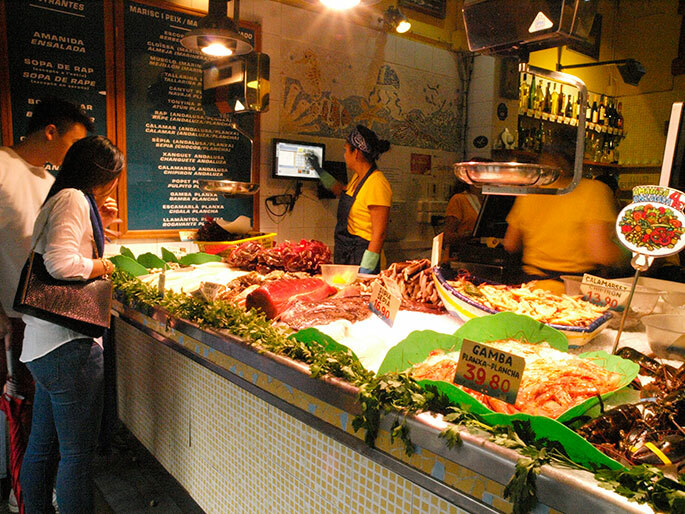 This no-frills, simple restaurant feels like a market stall (La Paradeta translates to this). Line up, choose from the mussels, crab, clams, prawns, lobster, octopus, squid and more, all laid out in market fashion over ice, and they’ll weigh it all on a plate which you then hand to the kitchen in exchange for a ticket. Then go and collect your food from the serving hatch when they call your number out over all the chattering and noise. No table-cloths, no waiters, just delicious, seafood for not much more than the ingredients cost. The food is star of the show here. 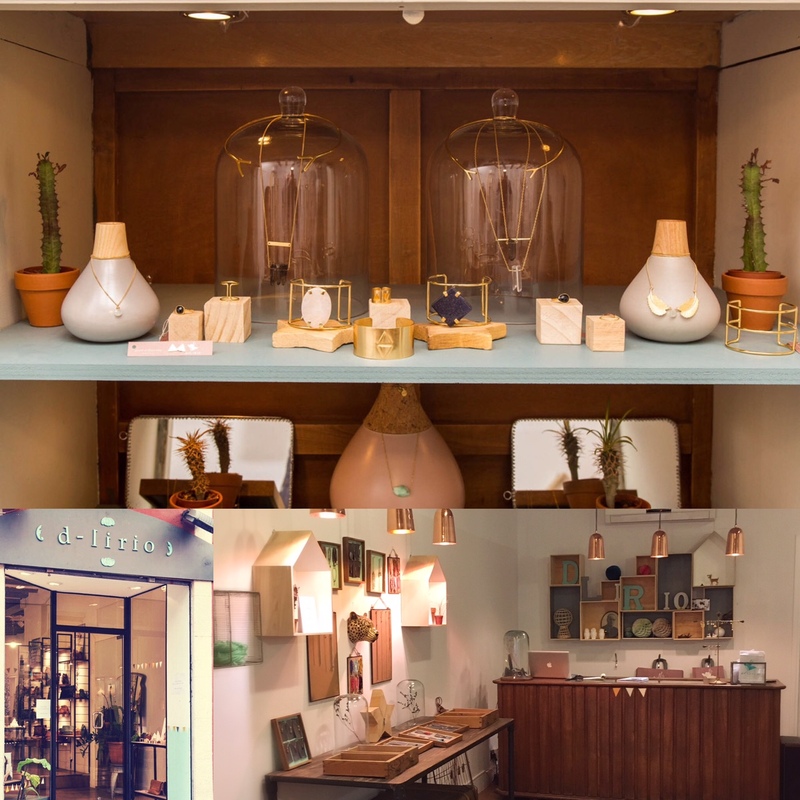 You can find some really cool and quirky shops in Barcelona if you know where to go. For uniqueness and better quality, stay away from Las Ramblas and Passeig de Gracia – the latter is a great shopping street if you’re looking for big designer brands but you can buy those anywhere. Barcelona has an unrivalled network of shops and boutiques by local designers with many beautiful one-of-a-kind handmade items so you might as well experience it while you’re here. Carrer de Verdi in Vila de Gràcia is Gràcia’s most famous street, where all the business and culture is focused. Whatever time of day you go it will be buzzing with people shopping, going to see a movie or play or enjoying some craft beers in one of its many bars. Along this tree-lined street is The Vos Shop (24 Carrer de Verdi), a casual street wear shop with a non-pretentious interior design. You’ll find minimalist, stylish everyday wear like cardigans, t-shirts and jerseys for a good price. Further up the street is Rekup & Co (61 Carrer de Verdi). 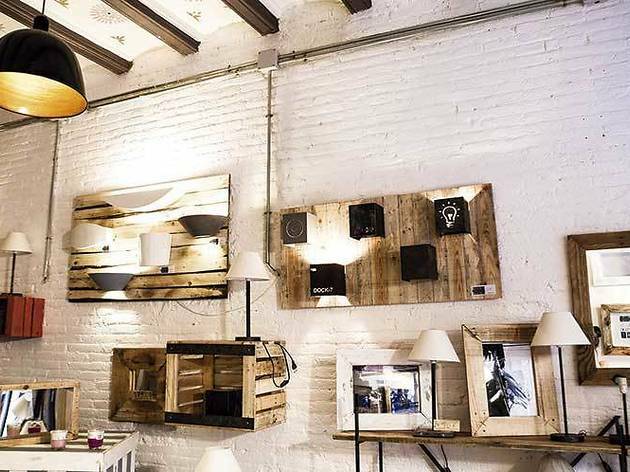 Everything in this interior design store is made out of recycled wood and iron and each piece is slightly unique. The self-taught designer and owner of the store, Emmanuel Wagnon, hand-crafts everything from lamps and light fixtures to furniture and rocking chairs. If you’re just visiting Barcelona, then most of the pieces will be too large for you to take home with you! But you will find little decorative pieces around the shop to add a quirky touch to your home that will fit right in your hand luggage. D-Lirio (11 Carrer de Verdi) is a jewellery and handbag shop in Gracia that designs and makes all of their products in Barcelona. They make delicate silver and gold plated pieces of jewellery and leather bags. Their style is simple, so you can pair the accessories with almost anything and add a little sophistication to your outfit. Sara Saavedra started out D-Lirio as a hobby but developed it into a business over the years, now creating her own original designs for everyone to wear. It’s these kinds of independent businesses that make shopping in Barcelona so unique. 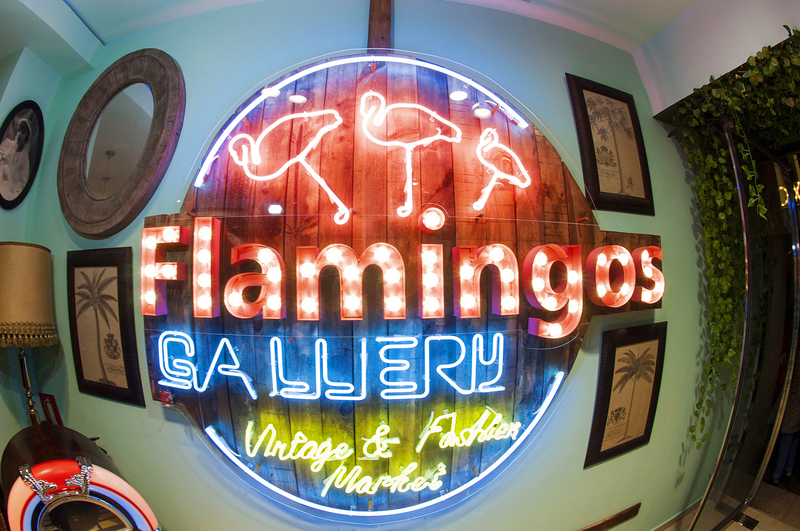 Over in El Raval, in the old part of the city, is a shop called Flamingo Vintage Gallery (68 Carrer dels Tallers). The vintage kilo sale is in the basement but it’s the top floor that we’re interested in. 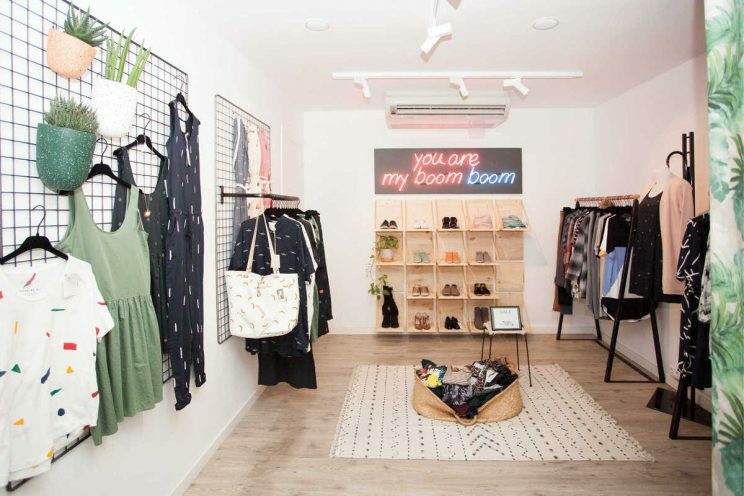 Local designers have come together in a sort of market style ensemble and divided the shop space between them to sell their different brands. There’s about four of five different designers, all with unique clothing and often handmade. Expect everything from sequin and holographic alien clutch bags to skater wear. Another great shopping area is El Born. Among this maze of small squares and winding narrow streets are heaps boutique and design shops dotted between bars, restaurants and cafés. You can find everything from artisan footwear to boutique furniture to independent art galleries as well as a tonne of hipster clothes shops and jewellery designers. You could quite easily spend a day or two getting completely lost, indulging in what El Born has to offer. These are just some example of the places we love in the restaurant and shopping scene in Barcelona. It is always worth it go beyond the hoards of tourists so you can get to know the city that the locals knows and get a real feel for its character. If you’ve been somewhere in Barcelona that you like, lesser known to tourists, we would love to know about it – tweet us at @FusterApartment or write to us on Facebook!